I hope you all had a wonderful Thanksgiving! Did you? Did you stuff yourselves silly and regret it later? Did you take too many pictures (is that possible) or not take enough? 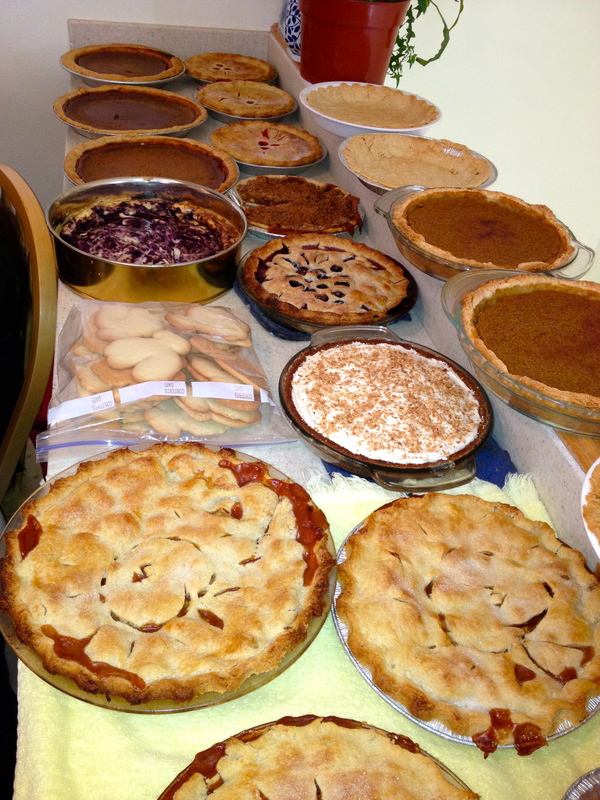 We had so many pies that I couldn’t even fit them all in this picture. Oh – deliciousness! Did you play games, watch sports or other fun family things? Did you start a warm fuzzy jar? Or gratitude jar or whatever-you-want-to-call-it jar? Oh good. My work here is done. Well, I don’t know about you, but we’re getting ready to put up Christmas decorations around here. I’ve already got the Christmas boxes out…just waiting until November 30th. I’m weird that way. And today we put the lights up on the outside of our house. We meaning me and my oldest child, Grant. It was super fast and super easy. Of course our house is small and not a 2-story house. That’s why it was easy. But you know what was even easier? Knowing where the strand of lights started and ended. Does that ever happen to you? 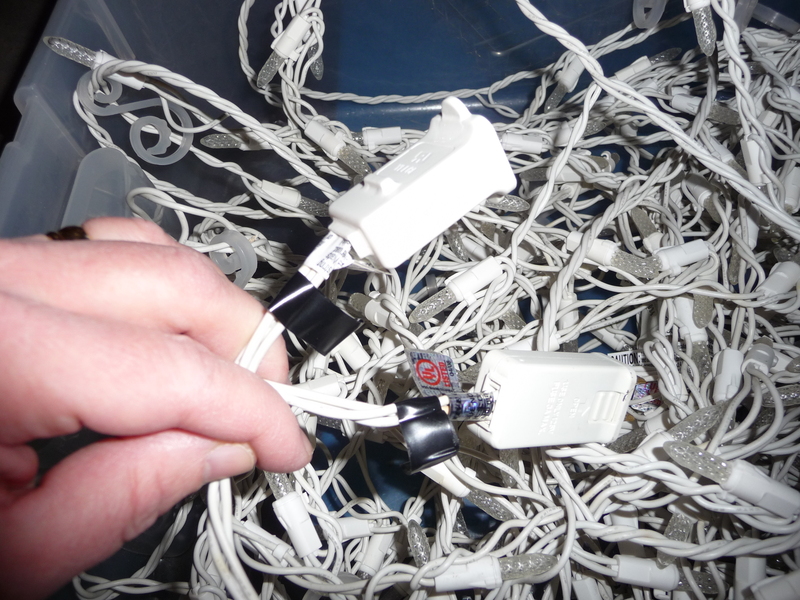 You pull out the Christmas lights and spend a good 30 minutes just trying to find the ends while also trying not to get them tangled up? In the above picture, can you even see any kind of end anywhere? Yeah. Been there, done that. But not any more. And this is why. Hopefully you noticed the black electrical tape on both ends of the Christmas lights. If not, look again. Look in the bottom left area of the picture. By putting black electrical tape on my white strands of Christmas lights, I now can spot where they begin and end with ease. With ease, I tell you! 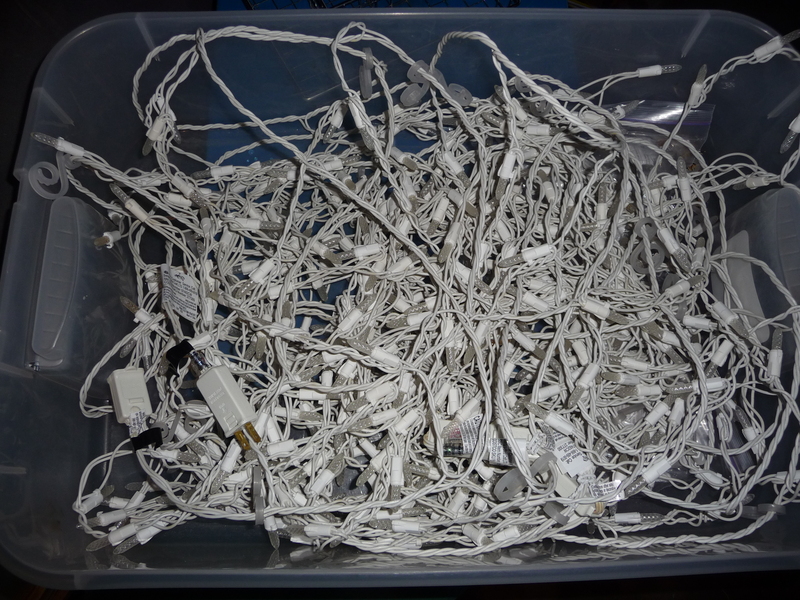 If your strands of Christmas lights are dark green, as many of them are, try using masking tape, or buy some light-colored tape to put at the ends. Trust me, it’s really cool when your Christmas lights start talking to you like that. This entry was posted in Holidays, Organizing and tagged Christmas lights, tape, Thanksgiving. Bookmark the permalink.